20110127 - Up and out to bfast w/ Lee & Richard. Then off to our first customer visit. The guys was late so we hung out in front of the building in crystal blue skies and a perfect 66 degrees; like a spring day in OH. We headed in and gave our presentation and it went well. Over to a book store, joined by Steve, to kill some time and then lunch. Off to customer #2. It also was a good visit. 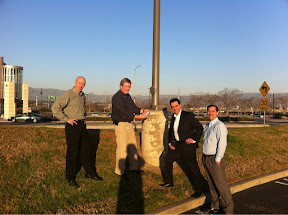 We ended this visit by introducing the customer to geocaching! Off to the airport and ANOTHER meal... Into the lounge to wait for the red-eye flight home. Checked in w/ L, her and the boys had a good day.